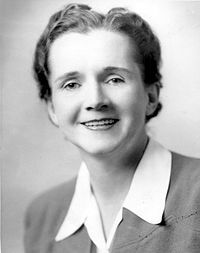 ↑ "Rachel Carson biography". Women In History. http://www.lkwdpl.org/wihohio/cars-rac.htm। আহৰণ কৰা হৈছে: 13 August 2012. ↑ Carson, Rachel (2010 সম্পাদনা). Encyclopædia Britannica. 2010. "in full Rachel Louise Carson born May 27, 1907, Springdale, Pa., U.S. died April 14, 1964, Silver Spring, Md."